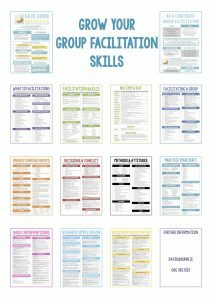 that will make you a more effective facilitator. Manage your team and keep them involved. Lead pleasant, and productive brainstorming and strategic planning sessions, AGMs, seminars and committee meetings. Expand your skills to new arenas and more challenging group types. Dave Dunn and Connect the Dots are partnering to deliver a training course to give ideas, processes, and practical tips for working with groups. 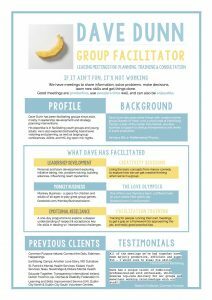 Dave Dunn has been facilitating groups since 2007, mostly in leadership development and mental health / wellbeing interventions. Whilst he is strong in facilitating youth groups and young adults, he is not averse to the likes of strategic planning sessions, conferences, AGMs, and MC-ing open mic sessions. 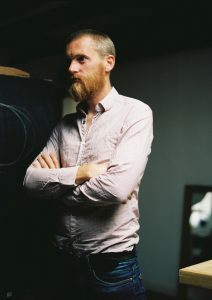 He is also involved in other group related projects such as: with creative events group Queens of Neon; the Inbetweeners and Carnival of the Impossible at the EarthSong Camps; part the Dublin Flea Market team; providing business therapy support to startup entrepreneurs; and managing mayhem at the Love Olympics. Dave Dunn is organised and playful. It’s got the exercises to be successful and the tricks to disarm. It gives you confidence and will greatly improve your skills of achieving the best outcome of any conversation, brainstorm, meeting or conflict resolution. Brilliant! Once you start, you realise how much in life is facilitating and being facilitated. It’s a safe space to learn and discover your own facilitation style in your own time. Brilliant course for the tools and practice of facilitation. Also great fun. 8 Tuesday evening sessions, from 6pm to 9pm.